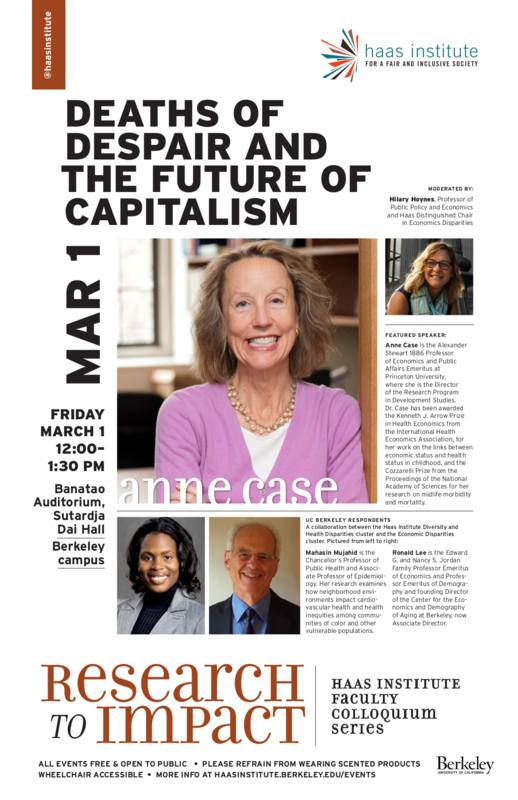 Anne Case is the Alexander Stewart 1886 Professor of Economics and Public Affairs, Emeritus at Princeton University, where she is the Director of the Research Program in Development Studies. Dr. Case has written extensively on health over the life course. She has been awarded the Kenneth J. Arrow Prize in Health Economics from the International Health Economics Association, for her work on the links between economic status and health status in childhood, and the Cozzarelli Prize from the Proceedings of the National Academy of Sciences for her research on midlife morbidity and mortality. Dr. Case currently serves on the Advisory Council for the NIH-National Institute of Child Health and Human Development, the President's Committee on the National Medal of Science, and the Committee on National Statistics. She is a Research Associate of the NBER, a Fellow of the Econometric Society, and is an affiliate of the Southern Africa Labour and Development Research Unit at the University of Cape Town. PhD Princeton. Dr. Mahasin Mujahid’s current research examines how features of neighborhood environments impact cardiovascular health and health disparities. Using data from several U.S. based cardiovascular cohorts, Dr. Mujahid seeks to improve the measurement of specific features of neighborhood physical and social environments and use state of the art statistical methods to estimate “causal” neighborhood health effects. In related research, Dr. Mujahid seeks to understand the multi-level and multi-factorial determinants of the clustering of cardiovascular risk factors (obesity, diabetes, hypertension) in racial/ethnic minorities and the consequences of this clustering on the long-term cardiovascular health of these groups. Ronald Lee is a demographer and economist, with a MA in Demography from Berkeley and a Ph.D. in Economics from Harvard. Since 1979 he has been at the University of California at Berkeley, currently as a Professor of the Graduate School in Demography and Economics. He is the founding Director of the Center for the Economics and Demography of Aging at Berkeley, now Associate Director. Throughout his career, he has taught economic demography. His current research focuses on the macroeconomic consequences of changing population age distributions and on intergenerational transfers and population aging. He co-directs with Andrew Mason the National Transfer Accounts project, which includes collaborating research teams in more than 50 countries, and estimates intergenerational flows of resources through the public and private sectors (NTAccounts.org(link is externa). He continues to work on modeling and forecasting demographic variables including mortality and on evolutionary biodemography, in particular the role of intergenerational transfers in life history theory. From 2010-2015 he co-chaired a National Academy of Sciences Committee on the Long-run Macroeconomic Effects of the Aging U.S. Population. He is an elected member of the US National Academy of Sciences, American Association for the Advancement of Science, American Academy of Arts and Sciences, the American Philosophical Society, and a Corresponding Fellow of the British Academy; he is a former President of the Population Association of America and a Laureate of the international population association, the IUSSP.